This small panel, which depicts a common motif in 17th-century Dutch and Flemish genre painting, entered the Thyssen-Bornemisza collection in 1928. The painting was acquired in Munich from E. A. Fleischmann’s Hof-Kunsthandlung and two years later was included in the exhibition of works from the Thyssen-Bornemisza collection held at the Neue Pinakothek in that city. The painting was acquired with an attribution to the Dutch painter Pieter Jansz. Quast, and was published as such in the catalogues of the Collection prior to Gaskell’s revision of 1990. However, Burchard, whose opinion was published in the 1937 and 1958 catalogues, considered it to be by Adriaen Brouwer. Ebbinge-Wubben published it as by Quast in 1969 but noted that this was an unconvincing attribution. Quast depicted military and peasant themes, endowing his figures with a caricatural tone. His work reveals the influence of Adriaen Brouwer, whom he could have known in Amsterdam or Haarlem. 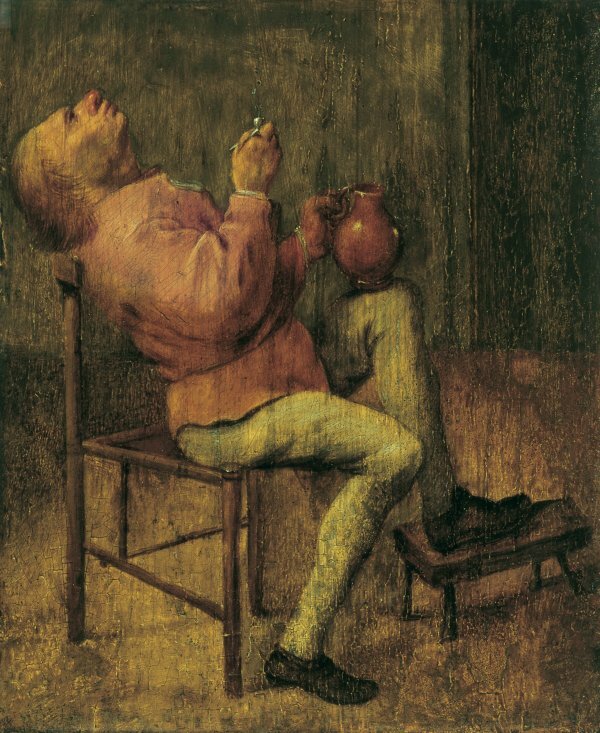 The present figure, which is of high quality with regard to the draughtsmanship and the depiction of the head, is comparable (as Gaskell noted) to some of the secondary figures of smokers that Brouwer introduced into paintings such as the one in the Mauritshuis in The Hague, the Alte Pinakothek, Munich, and a private German collection. Two further versions of the present figure are known: one was in the collection of Maurice Kann (present location unknown), and the other, slightly larger one is in the Städtische Suermondt-Museum in Aachen. The Aachen painting differs from the present panel in that the setting is more extensive and includes several objects in the background, while the figure, which is smaller, is better integrated into the room. The existence of those two versions led Gaskell to suggest that they were based on a lost work by Adriaen Brouwer or on a drawing by that artist, which was also used here by an anonymous follower. This unknown painter used a fluid brushstroke and limited colour range to depict a figure characteristic of taverns and inns in the Low Countries, where drinking and tobacco were the principal pastimes.